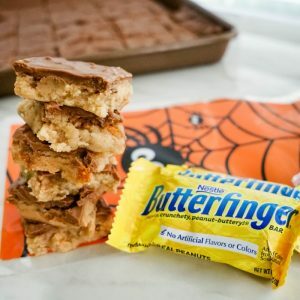 These fun and easy no-bake Butterfinger Cookie Dough Bars are the perfect Halloween treat to share. Also delicious for re-purposing your Halloween candy! Beat peanut butter, butter, brown sugar, vanilla, and sweetened condensed milk together, until evenly blended. Precook your flour for 1½ minutes in the microwave, to kill any bacteria on the uncooked flour. Then, add flour a half cup at a time, until fully mixed in. Fold in diced Butterfinger candy. Line a half baking sheet (13"x18" pan) with foil and spray with cooking spray. Press dough evenly into the pan. Set aside while preparing frosting. Unwrap the entire package of Butterfinger Peanut Butter Skulls (approximately 2 cups) and place in a microwave safe dish. Heat for 45-seconds and stir until well combined. If the need a little longer until fully melted, cook in additional 15-second intervals, stirring between, until melted and smooth. Add in powdered sugar to your melted peanut butter chocolate mixture, stirring until well combined. Spread frosting evenly over cookie dough bars. Using a butter knife, gently pull a straight lines about every 1-inch all the way down the length of the pan. Next, pull lines alternating directions every 1-inch the other direction. This will create easy breaking lines to cut the treats, even without a spatula later! Refrigerate for at least an hour. Cut into squares and serve! Makes approximately 24 cookie bars or 96 1-inch squares with 4 squares per serving.